Trevor and Georgi's apartment in Cabanas, Portugal. Relaxing holidays, retreats and wildlife tours based at a mountain finca in Fuenteheridos, Sierra de Aracena, Huelva, Andalucia, Spain. 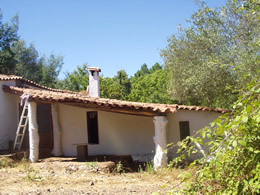 The finca - tour accommodation is currently at local hostels/pensiones, not at the finca. About Trevor - An old archived page from March 1998.